Homogenized milk is milk that won’t separate. Normally cream will separate out from milk, forming a layer at the top of the bottle. This is obviously not ideal, so to prevent this separation from happening, milk is treated with pressure to break up the little clusters of fat into much, much tinier pieces. These tiny globules of fat don’t recombine at an appreciable rate, so the milk remains a single layer throughout its shelf life. 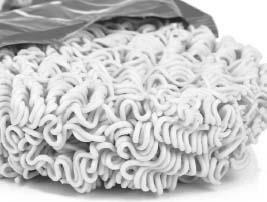 Instant noodles are pre-cooked and dried by flash frying. In this way, they can be stored for a long time and quickly cooked in hot water.